The CEOS Earth Observation (EO) Handbook presents the main capabilities of satellite Earth observations, their applications, and a systematic overview of present and planned CEOS Agency Earth observation satellite missions and their instruments. The 2014 Edition focused on the ways that satellite data help address global sustainable development challenges and, in particular, the information we need to define and implement well-informed environmental policies and the conventions that support them. 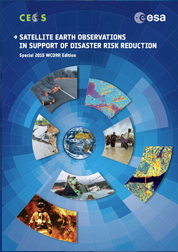 This new 2015 Edition explores how satellite EO contribute to disaster risk reduction in countries with varying capacity and infrastructure. It also highlights the main capabilities of satellite EO, their applications, and the challenges in converting satellite data into useful information and knowledge for disaster risk reduction. Both editions are available on the EO Handbook website, as is the annually updated CEOS Missions, Instruments, and Measurements Database — your go-to-resource for current satellite Earth observation information and plans.